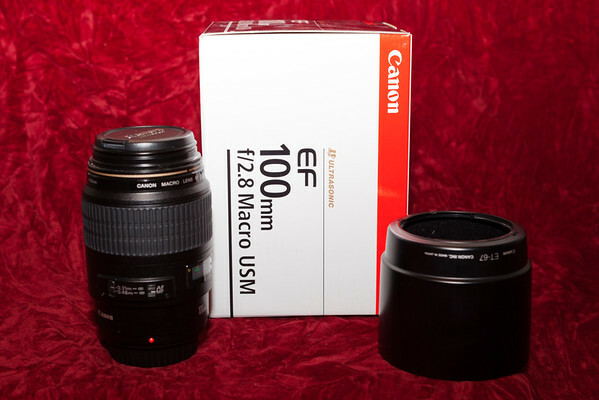 January 2, 2012 - This is the "product shot" for my Canon EF 100mm f/2.8 Telephoto/Macro lens that I used to post the lens for sale online. I've had this lens for a few years and it has, quite frankly, been a shelf queen. There really isn't anything wrong with it, but it isn't a lens I've ever used a whole lot. My biggest gripe, if there is one, is that the focus is a bit slow. This is actually fine if you're shooting macro shots of things which aren't moving very fast, but isn't very conducive to getting sharp pictures in any sort of dynamic situation. I've probably shot fewer than 50 frames with this lens in the time I've had it. I still have the Canon 1.2 extension tube, which can be used to shoot macro, which is something I find I don't do that much. Hopefully, it goes to a good home and I get a few dollars for more gear. The picture was taken using available light plus flash. There is a bare incandescent directly above and a "daylight" compact florescent at camera left and back. Neither of these lights contributed much. The flash was again my 430EX II gelled with 1/4 CTO and bounced off of a handheld reflector. This is a very similar shot to yesterday's bread photo. I will admit that this was a quick shot and probably could have used better focus, composition and lighting. For the intended use, it is probably better than average. Best of all, it didn't take too much time to pull off.